The quad square headlights and the body sculpture that fit them took the gaudiness away from the Colonnade-era cars... at least in most cases. The Buick Century had square headlights too, but they were vertically stacked. It was an improvement over the 1973-75 Buicks and it was unique compared to the Regals, Customs, and Specials, but it was still pretty gaudy-looking. The Monte Carlo and Malibu had stacked headlights too...which I never cared about. FWIW, the Cutlasses (including the performance-minded Hurst Olds and 442 variants) were the best-looking ones of the bunch, especially the ones with the slanted nose, similar to what was seen on the NASCAR stockers back then. Believe it was change for the sake of change - '76 - '77 model years in the GM mid size cars. Like the single round ones better - more simple and basic. The '73 - '75 A cars look better imho. Most prefer the quad lights of the '69 and '70 Chevelles as opposed to the singles of the '71 and '72 models. Of course the 69 and 70 model years were the pinnacle of factory horsepower, which gives them their value today. To further expand, the 1965-67 GTOs/Lemans (and most other Pontiacs and Cadillacs from that era) had stacked headlights, and the 1967-68 F-85/Cutlass/Hurst Olds/442 models had a strange configuration in which the turn signals were mounted in between the two lights on each side. IMHO, the stacked lights on the Pontiacs (and Cadillacs) looked better, but I still prefer the traditionally-arranged quad headlights. I have a theory as to why the Chevelles were switched to singles in 1971; it probably was to match up with the first-generation Monte Carlo (a personal luxury coupe that debuted in 1970)? And the BOP A cars (Skylark/GS, Cutlass/442, and LeMans/GTO) retained quads through the end of the "classic" era (1972). I have to disagree with the video editor, the popularity of the E-Body is a relatively modern affair. Everyone I knew that owned an E-Body absolutely hated them and said that they had spotty quality. I seem to recall a lot of older publications often put the E-Bodies below the F-Body cars and Mustang variants in the hierarchy of Pony Cars. For what it's worth Chrysler really nailed the retro look and feel when the 08 Challenger came out and really built upon it since then. The Challenger the most authentic looking of the current Pony cars and definitely is the most unique of the three on the market. I don't think there will be another production car with close to 400 cubic inches of displacement once the current Challenger and 392 are retired. How did Dodge/Plymouth manage to avoid the bumper standards on the '73 - '74 Challenger/Barracuda cars? Maybe it is hidden, the enhanced bumper and or hydraulic pistons. It appears that they still had the old style bumpers after the '72 model year. Unfortunate that they felt they had to cancel the cars after '74. Despite lower sales, perhaps the pair could have been kept as a "halo" pair of cars. The Mopar offerings post '76 were dismal in appearance to what one could have purchased just a few short years before. The 73 E-Body had bumpers that met federal regulations but slant destroy the appearance of the car like it did with the F-Bodies. I imagine that the lack of sales was reason enough to shutter the E-Body. Sales of the E-Body compared to the F-Body and Mustang were infinitely behind back in the 1970s. They just weren’t popular cars until fairly modern times. The main issue with those E-bodies saleswise was timing. Such came out just when sales of muscle & pony cars were already falling due to rising insurance costs and increased emission controls putting a damper on performance. The rising gas prices & related lines at the pumps that started just when the '74 models were rolling out (October 1973) effectively sealed the fate of those E-bodies. Read an interesting story in an older copy of Mopar Muscle. They (Chrysler)was working on a 75 Barracuda. In 1969. Lowered sales, myopic management, the embargo, insurance rates, and the changing federal requirements all conspired to kill E body continuance. In hindsight, would have just carried the car over, as larger GM did with the Camaro and Firebird. Which would have been interesting considering the F-Bodies really took off in sales during the tail-end of the 1970s despite being on an old platform. Suffice to say that in spite of the gas crisis and emissions that there was still a market for real Pony Cars. Yes & no. In many instances, those F-bodies sold on looks alone regardless of what was under the hood. Many of those lower-priced base models had 6-cylinder engines. Similar holds true for today's Camaros, Mustangs and probably Challengers BTW. For sure, the 1977 movie Smokey & the Bandit certainly helped boost F-body sales... especially the Trans-Am. However, larger 400+ cubic inch engines were starting to get scarce even then on those cars. For 1977, not one Chevrolet car offered an engine larger than 350 cubic inches and that included the Camaro. The last year the 455 engine was offered on the Firebird/Trans-Am was 1976 and the last year of the 400 was offered was 1979. One September 1978 issue of Motor Trend had an article that covered the then-ten years of the Trans-Am, mentioned that the then-new '79 model was the last of the super cars. While that generation F-body indeed soldiered on through 1981; the cars were indeed emasculated performance-wise. And I think it was republished in its sister publication Hot Rod as well showing the clay models of proposed 1975 Barracuda. 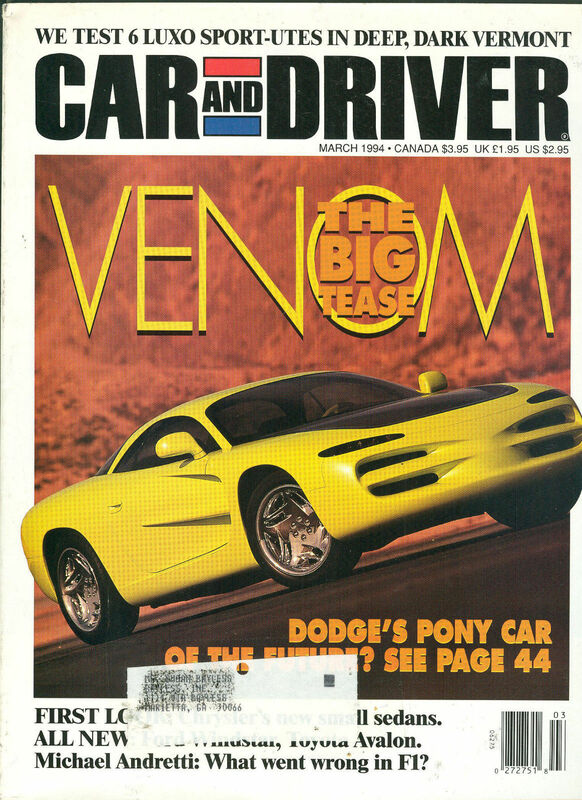 I also remember a 1994 concept car called Dodge Venom who did the cover of Car & Driver and that car did some nods to the E-bodies. If anything that design screams Charger more than Challenger or Barracuda. The Coke bottle sides were always something I associated with the Charger. Regarding the Trans-Am some states like California had more strict emissions requirements which meant that the Pontiac 400 was swapped for the Oldsmobile 403. For the most part the Trans-Am wasn't all that embarrassing until it got saddled with the emissions compliant 301 Turbo V8. The Camaro by comparison generally had the weaker engine lineup and in my opinion looked way worse than it's Pontiac counterpart was the 1970s wore on. The downsized 3rd Generation F-Bodies must have been a welcome change when they finally arrived by 1982. The downsized 3rd Generation F-Bodies must have been a welcome change when they finally arrived by 1982. Not sure about the Firebird/Trans-Am but the cross-fire-injected engines offered on those early Camaros of that generation had some reliability issues. Such was probably enough to send a perspective buyer over to the Mustang, which had just brought back the GT model as well as a high-output version of the 302/5.0L midway through the '82 model year. The F cars did not really have good power until the '85 tuned port engine. The interiors were plasticky, and they had that converter hump on the passenger floor. And the MacPherson strut front end was numb. The '93 - '02 upgraded car was better. Oh, the LeMans...probably even more out-of-place than the Nova in the same era was. Lots of baby boomers moving into prime age for buying such a car. Gold chainers was a Northeastern term for Trans Am and Corvette buyers. Many were Italian. Chrysler could have had some of those buyers too, if they had had a car (other than Aspen / Volare Roadrunner) to sell them.